Norway’s reigning chess champion, threatened with losing his crown after a shocking loss in New York Monday night, was being roundly blasted as a “bad loser” on Tuesday morning. After storming out of the obligatory press conference that follows all matches at the World Chess Championships, Carlsen now faces a hefty fine and, worse, a loss of respect. The drama occurred after the World Championship tournament finally secured a leader and it wasn’t Magnus Carlsen. His challenger for the World Championship title, Karjakin, now leads the best-of-12 match by a score of 4.5 to 3.5 points. The first player to reach 6 points, with four games remaining, will become the next World Champion. Carlsen, according to commentators, had appeared desperate to win Monday’s 8th game after the first seven all ended in remis (a draw). The two young players, both in their mid-20s, had thus been tied with 3.5 points. Carlsen was said to have “intentionally unbalanced” the position on the board by taking a piece with a pawn. “It was a risky idea and clearly indicated that, after so many draws, Carlsen was anxious to try to win,” according to World Chess’ account of the game. 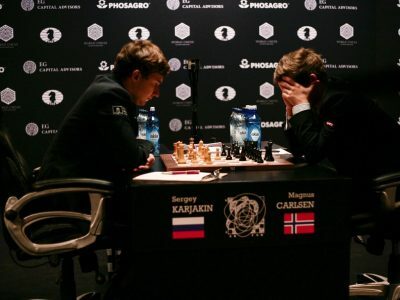 The position “quickly became complicated,” Karjakin “kept finding the best moves,” Carlsen found himself under intense pressure, and eventually lost. Then came even more drama, when Carlsen, after arriving at the press conference first, suddenly decided that he couldn’t be bothered to wait for Karjakin’s arrival. He stood up and left the press conference without answering a single question. His long-time manager Espen Agdestein, also a well-known chess player in Norway, ran after him calling out “Magnus!” as the defeated champion literally left the room. Carlsen now finds himself in highly uneviable position, not only behind his opponent with few chances left to claim victory but also with a tarnished reputation. Agdestein was left in a tough spot, too, as he tried to explain Carlsen’s behaviour. “Magnus knows that he is obligated to take part in the press conferences, so in this case, it was his temper that took the upper hand,” Agdestein told NRK around an hour after Carlsen’s dramatic exit and when he and Carlsen had arrived back at their hotel. “Magnus is just so determined to win, and like most, he despairs when he feels he has underperformed,” Agdestein added. “It is so limitlessly irritating that everything else becomes secondary.” He noted that Carlsen was preoccupied with the fame itself on the ride back to the hotel, not his poor performance at the press conference as well. Agdestein believed things had calmed down as they headed off to eat dinner, but that was before all the negative reaction to Carlsen’s behaviour started pouring in. A decision on what sort of fine Carlsen faces was due later on Tuesday.